"Le Mocassin a Talon" has been featured in many Fall 2012 fashion magazines in France. In Elle France, September 2012 and in Elle Canada, October 2012, the tasseled loafer upper sits on three different heels - thick, narrow and wedge. This shoe is touted as number one in the top four ways to get the "neo-preppy" look (France) or the "city-prep" look (Canada); if in fact, you want the "preppy" look - neo or city notwithstanding. The first shoe, from Lalil at 165 Euros, features a wedge heel but Elle is astute enough to offer another option from a lower price range - a 3 Suisses shoe with a lighter more feminine heel for 69.99 Euros. In Canada, the least expensive pair at $30. 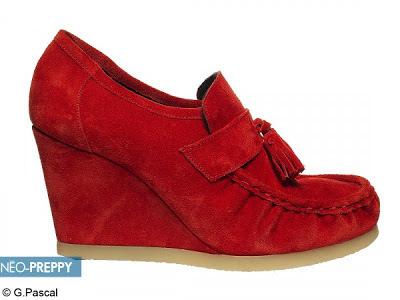 (Cdn) come from Old Navy and the most expensive pair featured are $219. (Cdn) from Miss Sixty. When I saw this shoe, I thought of a pair of Stuart Weitzman brown suede pumps I bought in 2007. This second style has been around before and is classic enough that it probably can be considered a standard in a working woman's wardrobe. 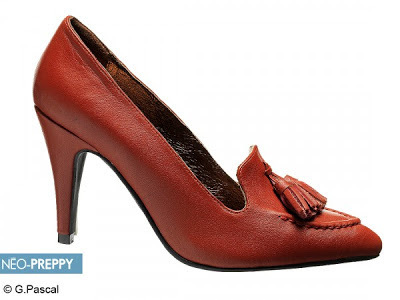 I'm going to have to look for those brown suede pumps with the tassels. NO THANKS: Marie-Claire France has a full-page Prada advertisement featuring a Bordeaux/Burgundy coloured tassel fringed loafer upper with a side buckle on thick high heels - "talons". These same shoes appear in an ad in Madame, a women's magazine produced for Air France. However, the price is probably eight times what the Lalil pair are and at the moment, I'm afraid the Prada choice is not for my closet. Price aside, it's also because I have this "loafer-upper style" in so many pairs of flats, the heeled version is not something I desire to add to my shoe closet. I love pretty much any type on flats shoe and it is really no surprise that shoe manufacturers like to add a new twist to their products so what better way then to add a heel to it. It's great for the person that loves the look of a flat but with the added height of a heel. For me personally I'll say "No Thanks" I don't need the added height and I prefer the comfort of flats as opposed to heels. Thanks so much for commenting and referring to one of my five "N" designations - Nice, Note-worthy, No Thanks, Need or New. I may be wrong but the last time "men's shoes" with a significant "high" heel in this style were "popular" was around 1976 to 1979 so you may not have even been in elementary school yet. I guess it's time for the trend to return. I haven't really looked but I haven't seen them promoted in the "men's" category although, I recognize you are not bothered by such categorization. For me this shoe is "Note-worthy" because I remember owning a camel coloured fringed pair with a heel 20 plus years ago. As well, at my height, I guess I should prefer a heeled variety but I'm not sure this time around. I had my chance while in Paris, but now that I'm in Canada I tend to be less impulsive in my purchases. Ahhh yes, 1976-1979. I remember in junior high school having a pair of boots with heels like that. It was around the time KISS was big in the music world. Lots of guys at my school had them. I always remember walking to school with my 2 best friends while wearing these boots. One or the other of my buddies would always say "we should run to school." They always wanted to see me run in those boots. I never own a pair of wedge loafer or Mocs, just the boots as a kid. Although I must give them a "Note worthy" since I do own a few pair of slightly lower heel wedge boots right now. Although they aren't in the men's category. I've heard a saying about clothing trends, that goes something like, "if you've worn it once and it returns, don't do it again" - the "it" of course being a trend. I did it though. I'll be writing about it in a future post. FYI it has something to do with platforms. Le Sweat Chic? Please - NO! How did I get to this site?